Pub in Hackney, just by London Fields. 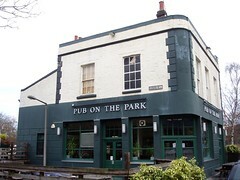 It changed hands in July 2010 and is now owned by Camden Bars. Prior to the change of ownership, it served real ale and Belgian beer. An anonymous commenter tells us that it still does, but we haven't confirmed this. There is extensive outside seating, but on warm days the clientele spills out halfway across London Fields park. Our anonymous friend also informs us that they do barbecues on the terrace, but we don't know which days (and which months) this applies to. Last visited by [dhyandeva]?, summer 2006 (prior to the change of ownership). Opening hours taken from the Pub On The Park website, July 2010. Last edited 2011-06-26 14:34:15 (version 13; diff). List all versions. Page last edited 2011-06-26 14:34:15 (version 13).